Embest SBC6000X is an embedded single board computer using Atmel's AT91SAM9261S microprocessor with low power and high reliability. 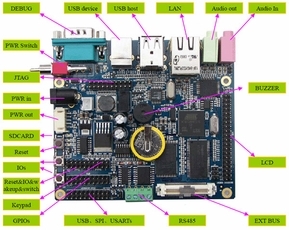 The board is a compact board with various peripheral interfaces including USB Host/Device, Ethernet, LCD/Touch Screen, Serial ports, Keyboard, Audio, SPI, SD and BUS. It features an extended precise RTC and RS485 with isolation. The board is capable of supporting both Windows CE 6.0 and Linux 2.6.24 OS. Embest provides BSP package, user manual and some other tools and documents to help customer better understand this board. User can use Microsoft EVC or provided linux tool chain for development to speed your time to market. The SBC6000X has various industrial Bus interfaces which can work stably in -10?~70? temperature or in any rigorous environment, specially some fields needs high requirements for communication, such as industrial field control, intelligent instrument, industrial control terminal and car electronics.